In addition to Memphis Dry-Rubbed Wings I served grilled brats with a funky chow chow at my driveway tailgate party. 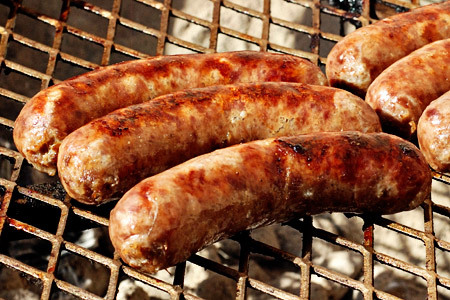 Brats are a definite tailgate classic, but this chow chow really makes them something special. 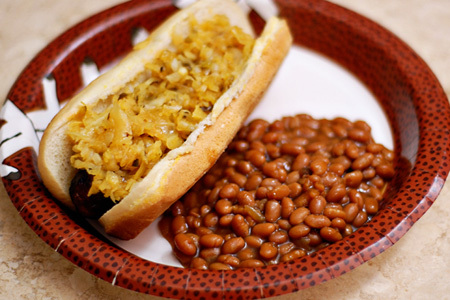 A chow chow is traditionally a relish that is, well, relished in the South. 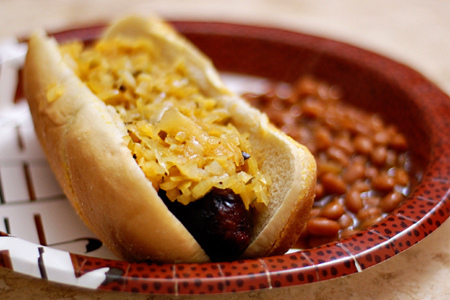 This version is decidedly different, with a base of sauerkraut and onion, the added tang of mustard and a slight spicy finish, which is perfect on brats. My inspiration was to combine many of the condiments that one might ordinarily put on a brat and add a few twists to make something unique. It worked well and my guests enjoyed it. I paired the brats with Bush's Original Baked Beans. The tender sweet beans were a great compliment to the snap and tang of the brats. Combine all of the chow chow ingredients in a medium mixing bowl, mix well, cover and refrigerate at least two hours, preferably overnight. Start your grill and prepare for two-zone cooking (indirect and direct) at medium heat (350-375º). Grill the brats direct until they're nicely browned. While the sausages finish cooking, warm the buns and heat the beans. Nestle a brat in a bun, load it up with chow chow, and dish up a mess of beans. I would like to thank Bush Brothers for sponsoring my gameday cookout. I've long been a huge fan of Bush's beans, and they have been nothing but a joy to work with.